Japan Airlines (JAL) announced couple weeks ago that it will be organizing a 2-day retirement tour for the MD-90 on January 12 2013 and promised to release more details on November 20 2012, which is today! So here are the details of the retirement tours. JAL has scheduled JA8070 to be used on this tour. It is the only MD-90 painted with the new livery because it was due for a paint job as part of the maintenance. But of course this could change due to aircraft maintenance and routing. There will be a total of 3 flights: Tokyo Haneda (HND) to Kushiro (KUH) and Kushiro to Oita (OIT) on Day 1 and Oita to Tokyo Haneda on Day 2. Below is the details of the itinerary. JAL has scheduled the HND-KUH flight to depart in the early morning so you can enjoy the sunrise up in the sky and the beautiful runway lightings at HND. The flight is scheduled to depart HND at 5:50 and you must report to the tour by 5:25. The flight will fly over Miyako, Asahikawa, Memanbetsu and Nakashibetsu and is scheduled to be the first flight to land at KUH on that day. The expected flight time is about 2 hours. After that, you will be staying at KUH for 3 hours and can take as much photos as you wish and spend some time at the airport. This flight is scheduled to depart at around 11:00 and the flying distance is around 900 miles. 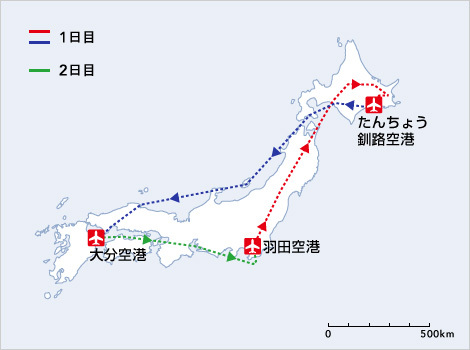 JAL planes to take the shortest direct route for this flight and will fly over the Hidaka Mountains in Kushiro, Hakodate, Sado, Sakaiminato and Iwakuni. Due to strong westerlies during this time of the year, the ground speed could reach as high as 350 knots. The expected flight time is 3 hours and the flight is scheduled to arrive at around 14:30. According to JAL, this flight can demonstrate the performance limits of the MD-90 (somehow I don't like the sound of this LOL). Lunch will be served during this flight. One of the reasons OIT was chosen was that it used to be JAS training base and you can see MD-90 doing touch and go at OIT all the time (KUH is no stranger to MD-90 either). Upon arrival, you can take some time to snap some photos but don't spend there for too long as you have to head to Beppu for the next part of the event. Participants are responsible for their own transportation to the hotel. Breakfast at the hotel will be provided. After that, it's pretty much free time until your flight in the afternoon. The return flight is scheduled to depart at around 14:30 and you can report to the airport as early as 12:30. The flight will fly over Shikoku and a completely different weather condition is expected compared to the one that demonstrated the MD-90's performance limits the day before. Expected arrival time is 16:00. Also, JAL plans to use the rear airstair for boarding and deplaning for these flights if weather and airport conditions allowed. This is usually not done and could be quite an experience! There is a bonus hanger visit on January 11, the day before the official tour. You will be able to take pictures with JA8070 at the hanger (but if that's not possible due to operational reasons, a regular hanger tour will be given). The tour will start at 15:30 and end at 17:30. To participate in this tour, it will cost you JPY79,800, which includes tickets on all three flights and the hotel. But if you want to upgrade your hotel or pre-assigned a preferred seat, it may cost you extra or could save you some money. Below are the surcharges for advanced seat assignments.